Friday June 28 1907 I cleaned silver and did some other finishings of the house cleaning. Mother came up at 10.20. I got the dinner and in the afternoon visited with her and too my cream [illegible] [illegible] apart. I am going to fix it different. I put Mother on the 5.37 car. I did my evening work. Went down to the store for some thread and was at Vaughns awhile. The baby is better. He has been very sick. I wrote Lorna after. Saturday June 29 1907 I did some baking early and a little sewing before dinner. Will went to town in afternoon. I sewed on my waist all afternoon. Most of the home folks went to the Presbyterian picnic today. I varnished the kitchen floor after supper. This has been a busy week. I am tired. 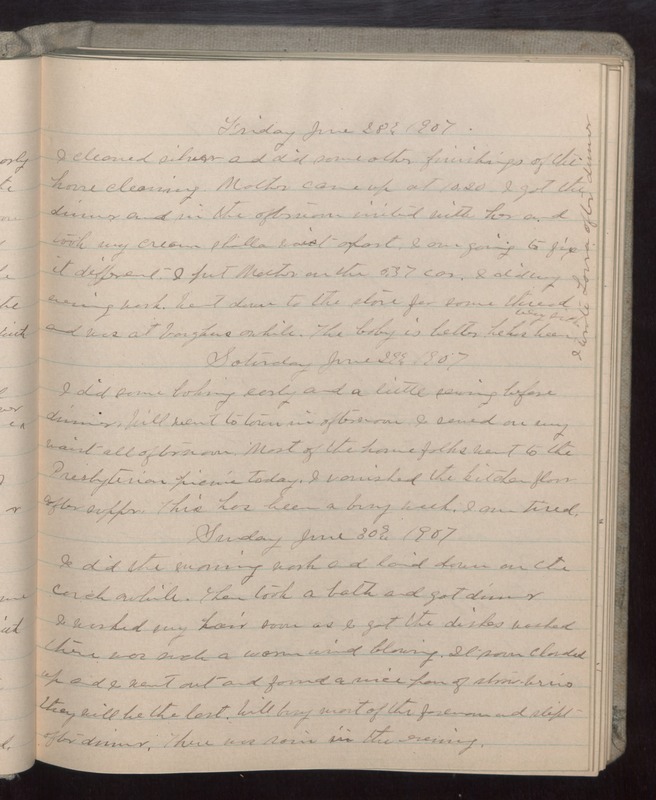 Sunday June 30 1907 I did the morning work and laid down on the couch awhile. Then took a bath and got dinner I washed my hair soon as I got the dishes washed there was such a warm wind blowing. It soon clouded up and I went out and found a nice pan of strawberries they will be the last. Will busy most of the forenoon and slept after dinner. There was rain in the evening.